Islam is restoring traditional British values such as shared responsibility and duty, a former archbishop has said. Rowan Williams said that Muslims had brought back “open, honest and difficult public discussion” in one of their “greatest gifts” to Britain. He used a speech yesterday to criticise sections of the press for portraying Muslims as “un-British” and complained of “illiteracy” about religion among figures in government. Secularist groups accused Dr Williams of “foolishness”, but his remarks were welcomed by British Muslim organisations. In 2008, when still Archbishop of Canterbury, Dr Williams provoked controversy by stating that the application of some aspects of Islamic law in British courts was “unavoidable”. He also drew both praise and criticism after telling a literary festival in 2012 that the hijab gave some Muslim women strength. Yesterday, Dr Williams, who stood down as the head of the Church of England to become master of Magdalene College, Cambridge, in 2012, told the Living Islam Festival in Lincolnshire that Christianity and Islam were shifting British values back towards the community. Earlier this year, David Cameron began a debate when he warned that a failure to be “muscular” in promoting British values had led to the rise of extremism. Andrew Copson, chief executive of the British Humanist Association, warned that the speech could undermine the UK’s social cohesion. “Narratives that promote the view that religious belonging is necessary for social responsibility may be comforting to those for whom the promotion of religion is a profession, but in the UK they are totally unsupported by evidence,” he said. 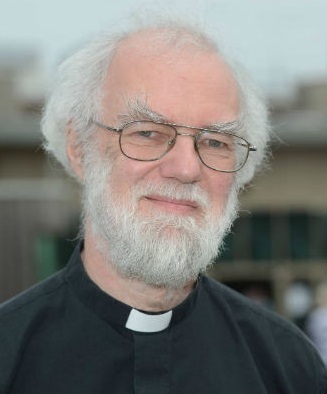 According to the Guardian report: “Rowan Williams, the former Archbishop of Canterbury, one of a number of non-Muslim speakers, gave a talk entitled ‘What do British values look like and is there room for Muslims?’ He expressed his unease about focus on British values rather than values of human beings generally. ‘The setting-up therefore of British values against any kind of values, whether Muslim or Christian, just won’t do,’ he said. This entry was posted in Resisting Islamophobia, Secular, UK by Bob Pitt. Bookmark the permalink.